Florence Smith Jacobsen was the sixth president of the Young Women organization, then known as the YWMIA, of The Church of Jesus Christ of Latter-day Saints. 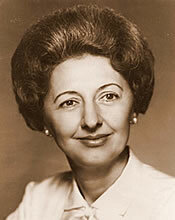 She served from 1961 to 1972. In 1973, Church president Harold B. Lee asked her to be curator for the Church, a position she held until 1985. Jacobsen was born on April 7, 1913, to Willard Richards Smith and Florence Grant Smith. She was a granddaughter to two former Church presidents, Joseph F. Smith and Heber J. Grant. Hyrum Smith was her great-grandfather, and her aunt Lucy Grant Cannon was YWMIA general president. She graduated from the University of Utah in 1934 and married Theodore (Ted) Jacobsen in 1935. They had three sons. She moved to New York City with her husband in 1955 when he was called to preside over the Eastern States Mission of the Church. Until his death in 2009, her husband was president of Jacobsen Construction Company, which builds many church temples and facilities. While serving as YWMIA president, she also served as a member of the Church Arts and Sites Committee. One of her accomplishments was to help rescue the Lion House from demolition and oversee its restoration, along with the adjoining Beehive House—both former homes of Church president Brigham Young. The YWMIA organization then operated the two buildings and made them self-sustaining. She also helped launch the New Era in 1971, a magazine that continues to be published for the youth of the Church. As Church Curator, she proposed that the Church build a museum to house and display historic treasures and then helped oversee the construction of the Museum of Church History and Art, located in Salt Lake City. She supervised the restoration of Brigham Young’s St. George, Utah, home, as well as the Brigham Young home in Nauvoo, Illinois; the Wilford Woodruff home (Nauvoo, Illinois); the Promised Valley Playhouse (Salt Lake City); the E. B. Grandin building (Palmyra, New York); the Joseph Smith Sr. home (Palmyra, New York); the Jacob Hamblin home (Santa Clara, Utah); and the Newell K. Whitney store (Kirtland, Ohio); and many other projects. She also oversaw the renovation of the Manti Utah Temple interior. The Mormon Historic Sites Foundation honored her with the Junius F. Wells Award in April 2010. She was known for her love of excellence. For example, “The old ingrained carpet pattern copied for the Lion House carpet was originally made with seventeen colors and the manufacturer’s largest looms had only twelve. To be able to restore it accurately, Sister Jacobsen negotiated—but did not compromise—and five retired weavers came back to hand-lay the extra colors during the weaving.” In the Joseph Smith Sr. home, she asked that the “curtains [be made] by hand—every stitch—just as Lucy Mack Smith and her daughters had done. Jacobsen also served as a vice president for the National Council of Women, chairman of the Child and Family Committee, and vice treasurer of the International Council of Women. She passed away on March 5, 2017, at the age of 103. This page was last edited on 23 April 2017, at 22:11.